Child of Mary M. Johnson and Col. William Nazareth Taylor Sr.
[S807] Find A Grave, online http://www.findagrave.com, Find A Grave, database and images (https://www.findagrave.com : accessed 12 February 2018), memorial page for Mary M. “Polly” Johnson Taylor (1 May 1793–26 Sep 1852), Find A Grave Memorial no. 34032360, citing Browns Cemetery, Franklin County, Tennessee, USA ; Maintained by Pamela Parks Costa (contributor 46842959) . Glen E. Pashon Jr. was born on 11 September 1967 at Geneva, Kane Co, IL. He was the son of Glenn Pashon and Shirley Ann Holcombe. Glen E. Pashon Jr. died on 15 March 2016 at Rock Falls, Whiteside Co., IL, at age 48. ROCK FALLS - Glen E. Pashon Jr., 48, of Rock Falls, died Tuesday, March 15, 2016, at rock Falls Rehabilitation & Health Care Center. He was employed at Self Help Enterprises. Glen was born Sept. 11, 1967, in Geneva, the son of Glenn Pashon Sr. and Shirley (Holcomb) Adams. Survivors include his parents, Shirley (Harold) Adams, three sisters, Rebecca (Mike) Klett, Ann Pashon, and Loretta (John) Collin, and one brother, Jeff Adams, all of Rock Falls; several nieces and nephews; and several great-nieces and great-nephews. He was preceded in death by two brothers, Harold Gene Adams Jr., and Michael Wayne Adams; his maternal grandparents, Tom (Bernice) Holcomb; his paternal grandparents, Bud (Doris) Unger; and stepgrandparents, Jay (May) Adams. Cremation rites will be accorded. A celebration of life will be at a later date. McDonald Funeral Home in Rock Falls is handling arrangements. David Goodrich was the son of Capt. Jeremiah Goodrich and Ruth Kimberly. David Goodrich married Penelope Holcombe, daughter of Judah Holcombe and Hannah Buttolph, on 9 November 1772 at Chatham, Middlesex Co., CT. David Goodrich died before 1781. Ruth Kimberly married Capt. Jeremiah Goodrich. 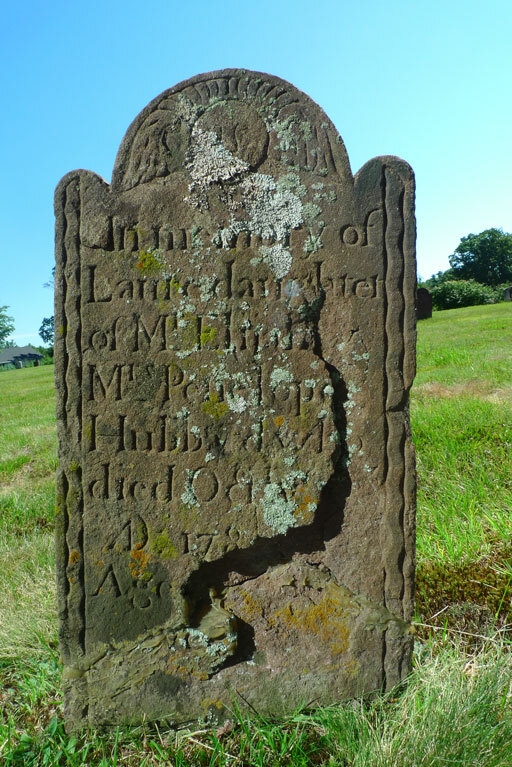 Ruth Kimberly was buried at Portland Burying Ground, Portland, CT.
Laure Hubbard died in 1785. She was born in 1785. She was the daughter of Elijah Hubbard and Penelope Holcombe. Laure Hubbard was buried at Center Cemetery, Granby, Hartford Co., CT.
Hattie Ernstnathe was born on 20 May 1908 at Germany. She married Francis Xavier Becker, son of Herman Heinrich Becker and Elisabet Maria Hillebrand, on 29 November 1929 at St. Louis, St. Louis Co., MO. Hattie Ernstnathe died on 20 August 1994 at Emporia, Lyon Co., KS, at age 86. Elisabet Maria Hillebrand was born on 16 November 1881 at Brilon, Germany. She married Herman Heinrich Becker on 18 February 1903 at Brilon, Germany. Elisabet Maria Hillebrand died on 1 July 1945 at Brilon, Germany, at age 63. Katherine was enumerated in the 1940 Kansas City, Wyandotte Co., KS, federal census in the household of her brother-in-law Henry T. Cunningham. Also enumerated with her were Donna M.5, Frederick S. 4, and Katherine E. 2. Casandra Cain married Henry Samuel Holcombe, son of Henry Alexander Holcombe and Hannah Trask, on 27 September 1860 at Chicksaw, IA. Juliette Holcombe was born on 24 March 1838 at Trumbull Twp., Ashtabula Co., OH. She was the daughter of Henry Alexander Holcombe and Hannah Trask. Juliette Holcombe married Reuben Hawley on 8 November 1857 at Ashtabula, Ashtabula Co., OH. Juliette and Jane were enumerated in the 1850 Trumbull, Ashtabula Co., OH, federal census in the household of Stephen Foster. Juliette was 12, Jane 10.